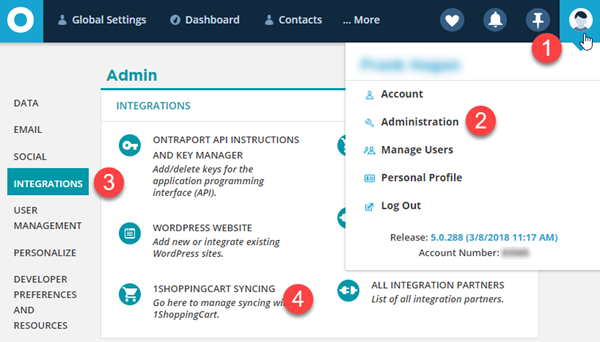 This integration enables 1Shopping Cart purchase data and product information to be pushed through to ONTRAPORT. You can choose either the Recommended API Integration with 1ShoppingCart or the Alternate Tracking Partner Sales Integration if you must have partner program tracking of your sales. You cannot have both methods active at the same time. Note: You cannot track Partner Program sales using this method. If you are tracking Partner Program sales use the Alternate Tracking Parter Sales Integration below instead. Tracking Partner sales can be difficult in 1Shopping Cart. Normally this is done by inserting the partner tracking pixel on the thank you page. However, 1Shopping Cart does not allow tracking pixels or PHP code on the default thank you page. For this reason, a custom thank you page must be created with the partner tracking pixel. Note: This process must be used in place of the API integration above. If both the API integration above and this partner tracking method is used the transactions will be double booked in ONTRAPORT. You must replace the text <<< YOURSUBDOMAIN >>> with your ONTRAPORT subdomain. Quick tip: You can find your subdomain by clicking the profile icon at the top right of your ONTRAPORT account, selecting Administration and then the Developer Preferences and Resources tab. Click the Get Partner Tracking Pixel link to see the default tracking pixel code with our subdomain. 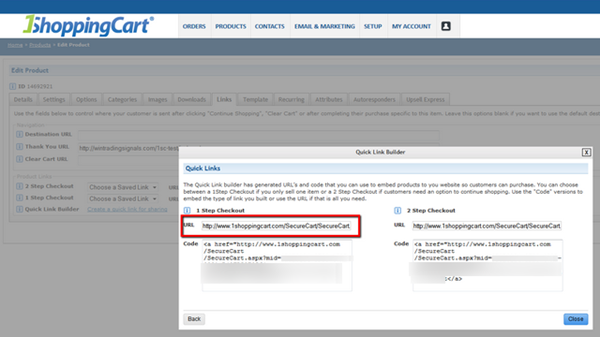 If you are using the default 1Shopping Cart thank you page, you must create your own thank you page to track Partner sales. The Partner tracking pixel code in the attached file 1sc-partner-pixel.txt must be edited with your subdomain and included at the top of the page to add the partner information to the contact record. Quick tip: For other post-transaction variables to display on the thank you page refer to the 1Shopping Cart User Guide in the Table of Contents > The Main Menu > Setup > Third Party Integrations section under the Available Post-Transaction Variables heading. To test the partner tracking pixel, send the promo tool to a test Partner account and use it to purchase the product. Use new contact information to ensure 1Shopping Cart creates the new contact record and populates the first and last referrer fields in the contact record. After your product is created in 1ShoppingCart run a test transaction. This will create the product in ONTRAPORT. You can then create Triggers in Campaigns based on the product purchase to set off the automation. The purchaser’s email address on the receipt must match the one you have listed for them in your ONTRAPORT account or the system will create a new Contact Record.